According to a Fremont County, Colorado web site the population of Whitehorn was less than ten as of 2014. Accounts vary, however, as to who founded the town in the mid-to-late 1890’s. In one account prospector Dennis Patno came to the area in February of 1897, struck gold and started a rush to the area in the mountains northeast of Salida. 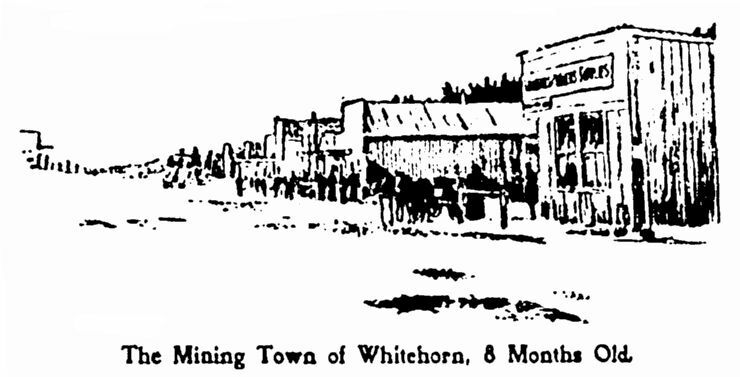 In yet another account the town was founded in May of 1897 by Arthur L. Whitehorn – according to a 1901 article published in the Whitehorn News, he was indeed the founder. Whitehorn had recently been appointed as U.S. Deputy Mineral Surveyor in Pitkin County, having also mined around the Tin Cup area. He set up his assayer’s tent at the camp some miners humorously referred to as “Suckerville”. However, the specimens he examined were promising enough and soon the town named in his honor began to be laid out. As soon as word spread of a gold strike, miners began to flood the area. Initially, forty plots priced at fifty cents each were laid out and drawn by lots. 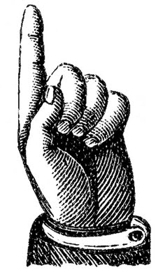 In those days gold strikes were reported throughout the region, especially in the Denver and Colorado Springs newspapers. It was big news and correspondents were sent to cover it firsthand. By June there were already about two hundred miners living in tents and shacks or in the twenty-some buildings which had already been erected. Edward M. Kraus was appointed as postmaster by the end of July, more than enough to make the town of Whitehorn “official”. By that time about one thousand people were receiving mail there. The townsfolk wanted to start a school that fall but no one seemed to know which county the town was located – Chaffee or Fremont. Turned down by both counties, even though it eventually was determined to be in Fremont, the town raised its own funds to pay teachers. By the end of 1897 Whitehorn claims continued to astonish prospectors as rich veins were mined on nearby Cameron Mountain. 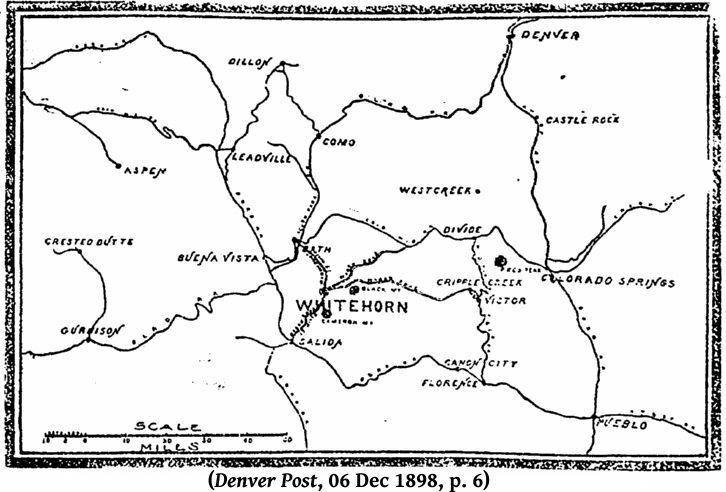 On January 1, 1898 the Denver Rocky Mountain News highlighted the newest gold camps in Colorado – Whitehorn was only one of many blanketing the state along the “Great Gold Belt” which stretched for 400 miles from north to south. Meanwhile, tensions between Spain and the United States were heating up and miners began to prepare for possible enlistment if a call for more troops was issued. The “Whitehorn Rifles” practiced daily and awaited word, but the short-lived war didn’t slow the pace of new claims and growth of the town. 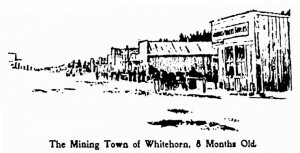 By the end of 1898 around eight hundred people lived in Whitehorn and there were two to three thousand miners in the district, which included other towns like Turret, Calumet and Manoa. In less than two years the area, previously known for grazing and timber, was transformed. At an altitude of well over 9,000 feet, water was abundant enough to have supplied water to a city of 10,000. Telephone lines from Salida had been erected and a stagecoach arrived and departed twice daily. Cripple Creek investors began to buy up claims and efforts to beautify Whitehorn were undertaken. Two miles of streets were macadamized and new sidewalks were laid as the town site grew to around one hundred acres. From the time of the town’s founding and throughout the first years of the twentieth century many headlines about Whitehorn contained the word “Rich”. One miner remarked as far as development went, “everything indicates richness.”3 There seemed to be no end to the gold. Everything was going so well – what could possibly change that “lively and prosperous camp”? If you know much about the history of gold mining camps throughout the West, most became ghost towns after either the gold played out, or in the case of several mountain towns, destroyed by fire. Such was the case for Whitehorn when a fire started at 9:00 p.m. on May 24, 1902 at the Witting Hotel. A defective flue in one of the stoves had gone unnoticed and high winds carried flames eastward down both sides of the street. Practically every business property in town was destroyed as residents fought the fire with wells and buckets. If the fire reached the southern part of town, nothing would be left. The telephone office and the post office were spared but several businesses, including the hotel, saloon, general store and lumber yard were destroyed. After the fire was extinguished those who had survived unscathed divided their household goods with the unfortunate. The weight of the tragedy had fallen on those ill-equipped to afford it and not much was done in the way of rebuilding. Still, Whitehorn managed to hang on for a few more years. Eventually, however, businesses began to close and residents moved away. 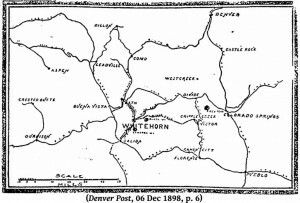 The Whitehorn News closed its doors in 1911. In 1912 the only business in town was the general store and post office. In 1914 forty residents remained, but the following year The Colorado Business Directory didn’t even mention the town; the post office closed in 1915. Many of the buildings left intact following the fire were taken away and moved elsewhere while others were dismantled and sold for lumber. Very interesting Sharon, thank you! But I wonder… if gold production was still going strong, why couldn’t the town rebuild after the fire? Perhaps gold production was petering out at about the same time. That I don’t know. Thanks so much for stopping by! That is very interesting … thanks for stopping by to share more about the story of Whitehorn, Colorado. The blog article has been snipped of most original content and will be featured later in an issue of Digging History Magazine, a monthly digital publication (www.digginghistorymag.com) available by individual issue purchase or subscription. I have plans to feature a Colorado-themed issue in the not-too-distant future and will likely include this article (and others) about Colorado history.